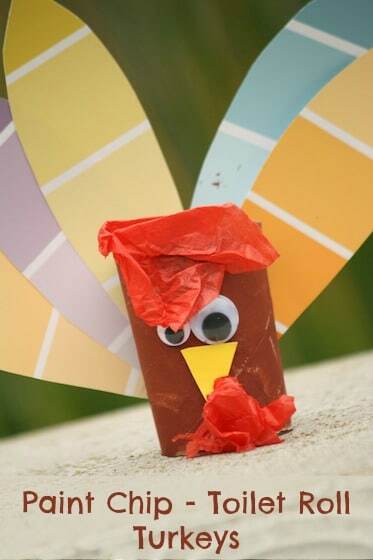 This toilet roll turkey craft is perfect for toddlers and preschoolers. They make great table toppers and window sill decorations, and kids will have fun making them. 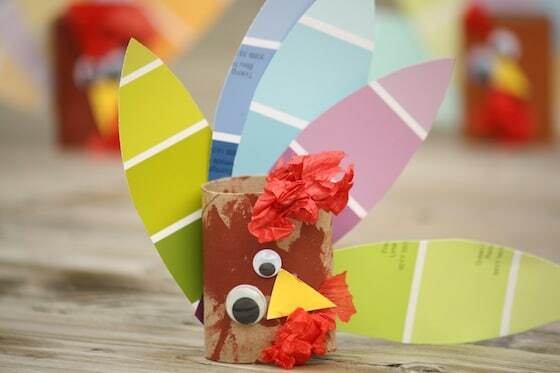 If you’re looking for an adorable Thanksgiving craft this toilet roll turkey is super-cute and super-easy to make. . 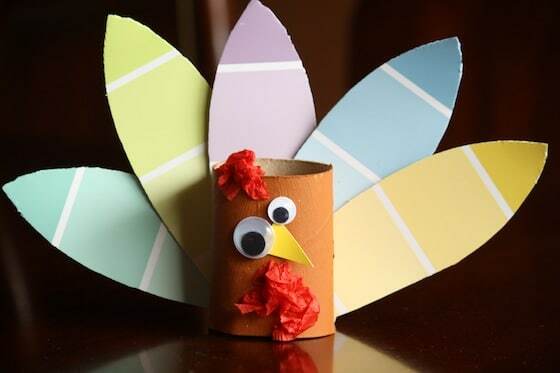 It might seem a bit early to be sharing turkey crafts, but we celebrate Thanksgiving more than a month before they do in the U.S. American friends and followers, you might want to pin this for next month. Ok, forgive me for the lack of children in the photos today. We got started crafting in the basement, and it occurred to me, when the 1 and 4-year-old were well and truly into the paint and glue, that I had left my camera upstairs; so just pretend that this post is full of adorable hooligans crafting happily. Cut your cardboard roll to the size that you want it. We took our toilet rolls down to about 3 inches. Paint the toilet roll brown. Not necessary of course because toilet rolls are already a greyish-brown which is a very turkey-appropriate colour, but painting makes every project more fun, so why not? While your paint dries, cut a few paint chip samples into “feathers” (I just cut narrow ovals with pointy ends). When your paint is dry (a blast from a hairdryer helps speed that process up), help your child staple the feathers to the back of the cardboard tube. The hooligans LOVE the stapler, but going through this many layers required some extra muscle, so I placed my hand on the stapler along with both of theirs and we worked together to secure everything in place. Lastly glue on your turkey’s eyes and beak (cut from a yellow paint chip sample) and a bit of crumpled, red tissue paper “wattle” under the turkey’s beak. Special note: For the record a turkey does NOT have a red comb on top of its head like ours do in the photos. For some reason, I thought they did, but when I googled an image of a real turkey, to show the hooligans, after we’d made our craft, I discovered I was wrong. and if you’d like another turkey craft, check out our Turkey Footprint Craft. Haha! Maybe, Jessica. That’s why I just ask if they have any swatches that they’d be willing to part with for our crafting purposes. There are colours that aren’t popular for room painting, but are great for crafting with – think bright blues, reds, greens, oranges etc. I love the honesty and humour you add to your posts! I love your crafts! Any ideas for those paint sticks from paint department? We’ve never actually used them for crafting, Natasha. Good idea though! I’m sure if you google “paint stick crafts” you’ll probably find lots of ideas. As usual you’ve come up with just the cutest craft ever! In love with these turkeys!! 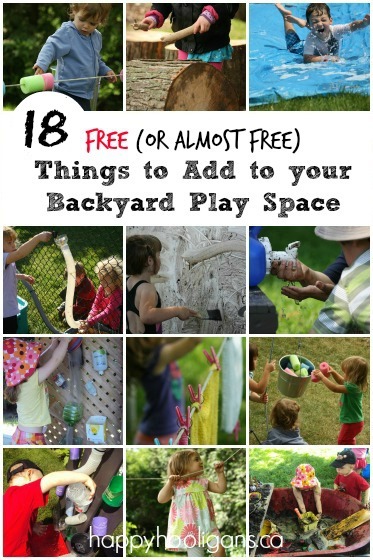 Thanks so much for linking up to Discover & Explore! Just too cute for words! I love your obsession with owls and toilet paper tubes. 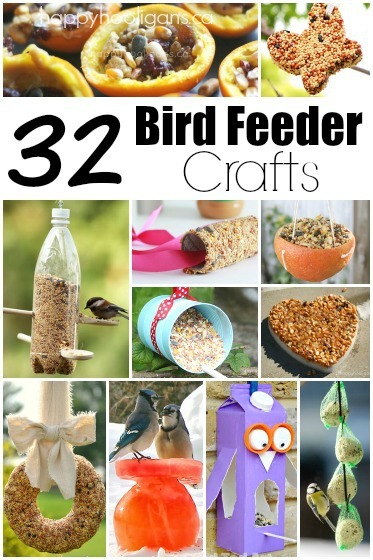 So many crafty ideas you share. Thank you for sharing on our Facebook page. Pinned! I love the paint chips! I have featured this on The Sunday Showcase as well! 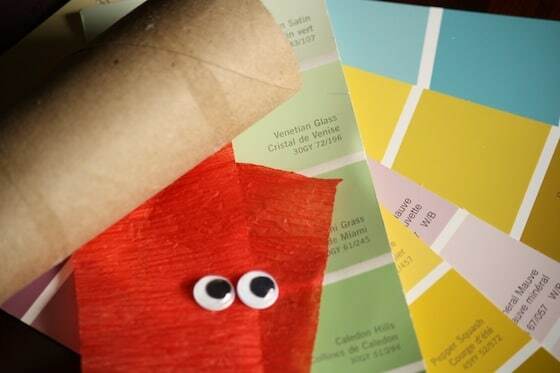 Paint chips are such a fun, free craft product- yay for Home Depot! 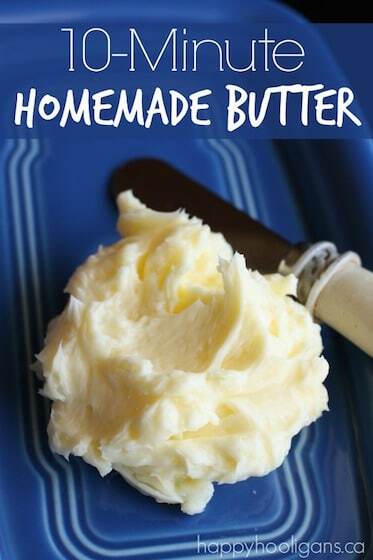 hanks for sharing at the Foodies and Crafties Soiree! You are one of my feature picks from the Foodies & Crafties Soiree at http://www.creativesouthernhome.com. Love the use of paint chips! Thank you, Kailee Anne!! I’m so glad you liked them! Happy Thanksgiving! Thanks for sharing at Foodies & Crafties Soir�e! made these but used fallen leaves instead of paint chips. thanks for the great idea.